Across the globe, consumers have come a long way in what they value and can do to make the world a better place through the different roles they play in society. On the one hand, in their primary role as buyers of goods and services, consumers prefer directing their spending in ways that support their beliefs. On the other hand, in their role as employees and shareholders, individuals like organizations that, again, support and promote their values. 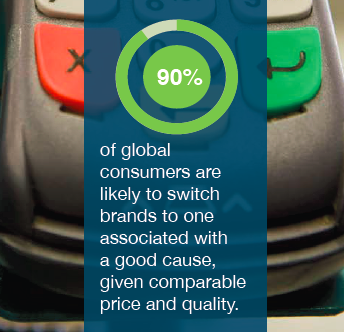 A recent nine-country consumer survey of attitudes, perceptions and behaviors around Corporate Social Responsibility (CSR) – 2015 Cone Communications Global CSR Study – shows that more than being just a consideration in shopping aisles worldwide, CSR is now woven into the very fabric of how consumers lead their lives. The study reveals that global consumers view CSR as a personal responsibility to be integrated and championed – across the things they buy and the companies they work at and invite into their neighborhoods – and are willing to make sacrifices to address social and environmental issues. Guilty by Default: The survey found that consumers have grown suspicious of corporate behaviour (perhaps influenced by the recent crisis of 2008) and are no longer willing to take corporations at their word. 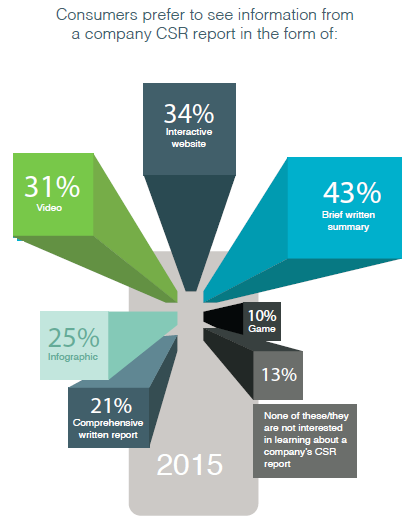 So while consumers expect companies to act responsibly, 52% said they need to see proof of a company’s CSR initiatives to believe them. So companies must develop comprehensive CSR programs and publicize their results across multiple touch points. Personal Accountability: 90% of the over 10,000 consumers surveyed said they would switch to brands that supported responsible causes, and 84% bought responsible products when available. 71% of those surveyed said they would pay more for socially responsible goods and services, and 81% said they’d curtail wasteful spending if it would have a positive impact on environmental and social issues. Rising CSR Awareness: The survey found a 6% increase in global consumer awareness of the role corporations must play in promoting CSR. If companies engage in meaningful CSR, they must set bold goals and have clear and consistent CSR communications. Opportunity to Engage Consumers: Broadly speaking, the study suggests that this is an opportunity to engage consumers more fully in new CSR solutions and collaborate to push the boundaries of responsible consumption and lifestyle by giving consumers more opportunities to create individual impact while also developing corporate branding. Leverage New Social Media: Study data also revealed that consumers now get their CSR information from a host of media that ranges from advertising to company websites and social platforms. So corporations must step-up their communications in a manner that effectively connects with their target audiences, and embrace emerging technologies and social channels to educate consumers about CSR efforts, create a dialogue, and inspire and show them how to take action. Build Brand Loyalty and Profits: Finally, well run CSR programs can act as catalysts that spark donations, volunteerism and advocacy by developing programs around causes that connect with consumers and offer them a spectrum of ways to get involved. Partnering with consumers in this manner can serve as both, a reputation and a bottom-line builder. When used effectively, CSR can become a boon to brand reputation and affinity. In the Global CSR Study, consumers state that they have a more positive image (93%), are more likely to trust (90%) and are more loyal to (88%) companies that support social and environmental issues. Further, global consumers consider CSR commitments when they look at which companies they want doing business in their communities (84%), where to seek employment (79%) and what investments to make (67%). With this growing consumer sophistication comes new pressure on companies to break through, and leverage CSR for competitive advantage. In this world of higher expectations, consumers will take note of companies that go above and beyond, and call out those that fall short. So the onus rests squarely upon corporations to impress all stakeholders – employees, consumers, partners, activists and shareholders – and build efficient, inclusive and active CSR programs.